Still Life by Jacqueline West. Volume 5 in The Books of Elswhere Series. Review: A fantastic book series by Jacqueline West will leave you flipping the pages. The Books of Elsewhere: Still Life has a special twist that interests the readers. Olive's adventures will lead you to the next book. 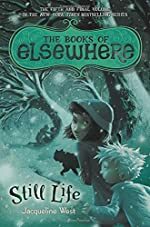 Olive is the girl in the story who is uncovering all the secrets behind Elsewhere; she is the character in this book that is the adventurer. This book focuses on a woman named Annabelle McMartin. Everyone knows she is dead, but Olive is determined that there is a big secret behind all of this. Olive takes a trip to the local art museum; where she sees something, which is the most remarkable thing she has ever seen. This amazing sight takes Olive on a fascinating, unexpected journey. She uncovers secrets of Morton's mysterious vanished parents and finds out from the deepest darkest roots of Old Man McMartin's strange world. Nonetheless, in this final book, Olive uncovers the full story of Elsewhere and the destruction of Elsewhere itself. Olive risks her own ability for the people of whom she loves. How long will she keep up with this? What will happen to her and what might she get herself into? We would like to thank Penguin Young Readers Group for providing a copy of Still Life for this review. Have you read Still Life? How would you rate it?